This bracelet is stunning! 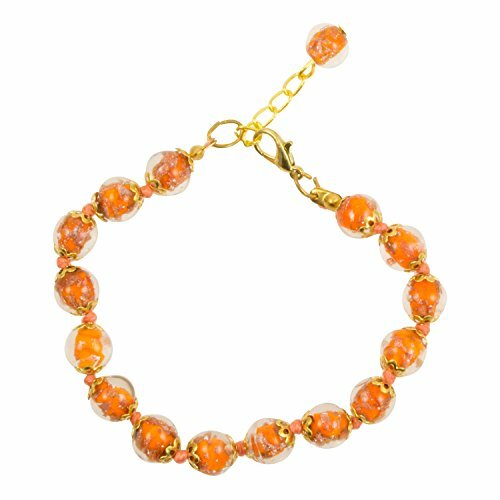 The orange beads are of the highest quality from Murano, Italy. A beautiful bracelet that any women would love to have in her collection. Matching necklace and earrings available. The renown quality of Venetian beads begin with Effetre Glass canes and is combined with the skill and experience the bead makers of Venice and Murano to produce the most sought after and exceptional glass beads made anywhere. Aventurina is sparkling copper crystals seen in many of our beads, providing a richly toned look to most anything to which it is added. Mix the aventurina beads with some of our copper findings to create an luscious look. If you have any questions about this product by Just Give Me Jewels, contact us by completing and submitting the form below. If you are looking for a specif part number, please include it with your message.